A baked dessert made from sweetened grated coconut. It is often decorated with red food colouring. The coconut used is 'white' since it is peeled or scraped to remove the brown outer layer. 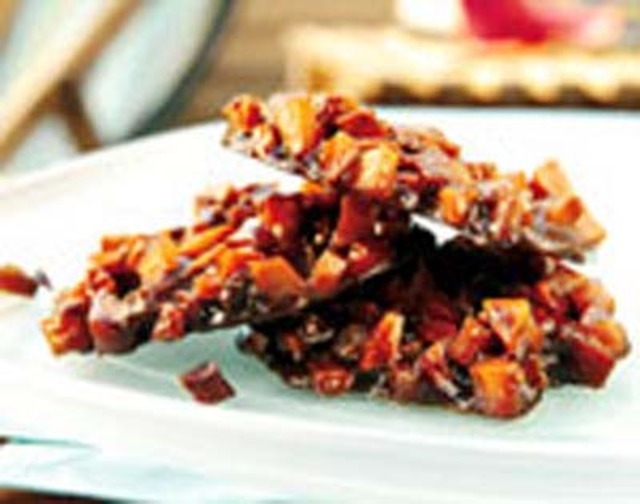 A sweet treat made from diced coconuts, sugar and spices. The mixture is boiled until thick enough to set and harden when cool, then spoonfuls are dropped onto banana leaves or other flat surfaces. In Barbados it is not generally made from diced coconuts but finely grated coconut and can be found in not only in the original brown colour but white, pink, green and other colours as food dye can be added to the mixture.